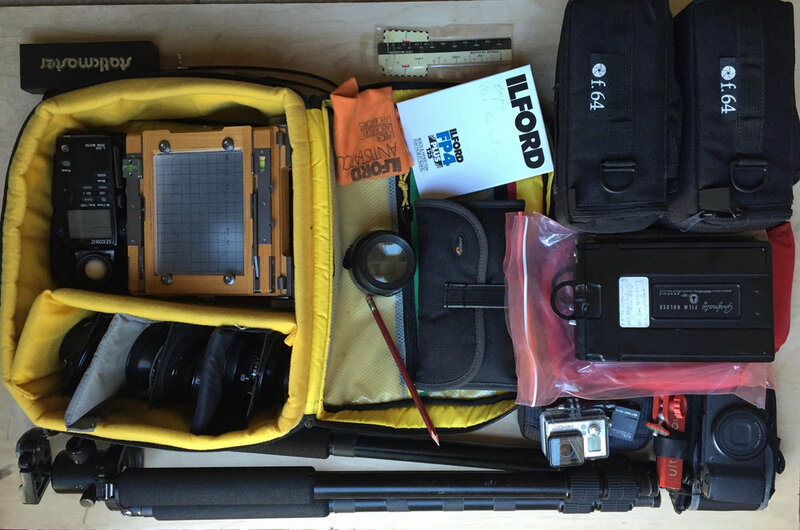 Thought it would be fun to share what goes into my backpack for shooting with my 4×5 camera when I know I’m going to venture away from the car…..
Why a Kelty Redwing 5100 instead of a dedicated camera backpack? Comfort and weight!!! The Redwing is more than 8 pounds lighter than my old dedicated camera backpack… and SO much more comfortable! I can easily turn this into a quick overnight kit by taking out one of the packs of film holders (and reloading in the field) and inserting a sleeping bag, pad, food (can even fit a small ultralight stove/fuel) and a backpackers poncho which turns into a shelter. I can also trim this kit down to fit into a Kelty Super Tioga External Frame backpacking pack for up to 5 nights in the wilderness without having to resupply. Total weight of camera gear w/ film 18-20 pounds. My ultralight backpacking kit (everything else I need to survive for days in the field) comes in around 20 pounds. Here is my bag with a 4 lens kit: 75mm, 90mm, 180mm and 300mm. I have since replace the 180mm with a 150mm and a 210mm. The Kelty Redwing 5100 and it's load ready for a trip! PHOTOGRAPHY – IT’S ABOUT BEING IN THE RIGHT PLACE AT THE RIGHT TIME!